Ashwagandha Gold features KSM-66 Ashwagandha, an award-winning, patented, certified-organic, clinically proven extract of ashwagandha root standardized to contain the full spectrum of all the natural compounds in the herb and synergistically formulated with ashwagandha whole root powder. KSM-66 features the highest percentage of withanolides derived from roots alone (5%, by HPLC) and its safety and effectiveness are supported by clinical and preclinical studies. Ashwagandha Gold is manufactured in the USA to industry-defining quality standards and is verified by independent third-party labs to meet identity, purity, and potency label claims. Ashwagandha, also known as Indian Winter Cherry, is an adaptogenic herb that supports the body's ability to maintain physical effort and adapt to various types of stress. Perhaps the most famous rejuvenative botanical in Ayurveda, ashwagandha is one of a rare group of botanicals and mushrooms possessing unique properties that helps support the body's ability to resist and recover from stress, thereby providing an enhanced feeling of overall well-being. Ashwagandha root is nutrient-dense; it contains prebiotic fructooligosaccharides, vitamin A, essential amino acids, calcium, and iron. Ashwagandha works to help the body manage symptoms of stress and promote rest, relaxation, and mental clarity. These effects are believed to be a result of its complex blend of active constituents, including withanine, somniferine, tropine, and withanolides. Ashwagandha Gold is Non-GMO Project Verified, which provides assurance that the product has been manufactured in accordance with the best practices for GMO avoidance. The Non-GMO Project is North America's premier verification program. Ashwagandha Gold is certified organic by SCS Global Services. An official partner of the USDA, SCS Global Services certifies products that contain between 70% and 95% organic ingredients. Most consumers consider kosher products to be cleaner, healthier, or better than non-kosher products. 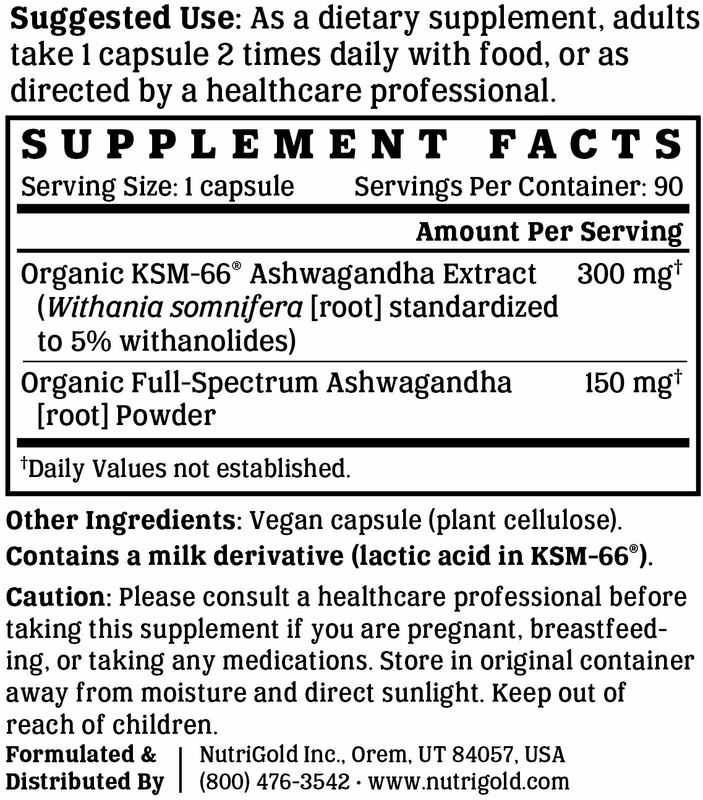 The Ko Kosher symbol on Ashwagandha Gold is assurance of our brand's unwavering and uncompromising commitment to accountability, quality, and overall safety. We like to make supplements that can be enjoyed by everyone. That's why our products are always compliant with the best practices for avoiding allergens and minimizing cross-contamination. Ashwagandha Gold is free of soy, gluten, egg, peanut, shellfish, and corn allergens. Consistent with our guiding principle to “do no harm,” Ashwagandha Gold is manufactured without the use of additives or preservatives. It contains absolutely NO contaminants, pesticides, herbicides, harmful additives, residual solvents, magnesium stearate, or hexanes. Like all NutriGold products, Ashwagandha Gold is subject to over 140 purity and potency assays by independent, third-party labs to ensure that the product meets or exceeds its claims. So, you can be certain that what's on the label is what's in the bottle. Nothing more, nothing less.